The great J.C. Hallman–author of, among other things, The Devil is a Gentleman, and editor of The Story About the Story–has a new book coming out in August, In Utopia: Six Kinds of Eden and the Search for a Better Paradise. In classic Hallman style, In Utopia combines personal essay-style reflection with travel journalism and a good bit of history. I’m working my way through the galley right now, and enjoying myself very much. You can read more about the book on Hallman’s website. 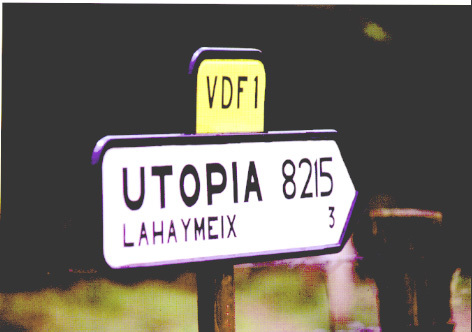 You can also find a short excerpt from In Utopia, in the summer issue of Bookforum, which happens to be utopia-themed, and also features–among its many wonders–duelling u/dystopia essays by Paul La Farge and Keith Gessen. Still not enough Hallman for you? Well then turn your attention to The Millions, then, and read two new essays, “Ayn Rand, Rand Paul, and Utopian Schemes“, and “Drifted Toward Dragons: Utopia Today“. So that’s the latest in Hallman-related happenings. Look for the book in August.